You can listen to Marvel’s podcast featuring Sebastian and Chris below! 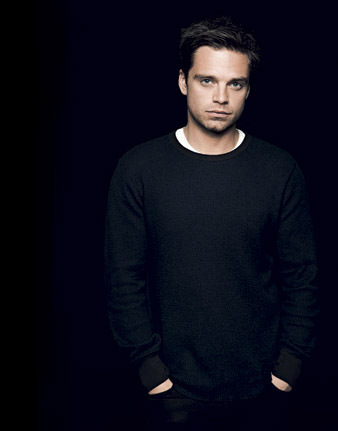 Sebastian Stan To Attend 2014 Philadelphia Comic Con! Sebastian will be at the 2014 Philadelphia Comic Con beginning on Thursday, June 19th, 2014 at 3:00 PM and ending on Sunday, June 22nd, 2014 at 5:00 PM. You have an special opportunity to not only meet Sebastian, but get a autograph and a photo! And how does that get any better? He also has a special photo op with his Winter Soldier co-star, Anthony Mackie! • VIP’s get onto the show floor 30 Minutes before regular attendees on Saturday & Sunday! Note: Autograph Tickets will be provided at VIP registration. Autograph ticket will be collected at the Celebrity booth for redemption. 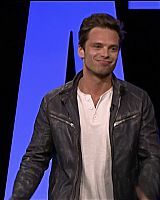 Sebastian dropped by Chelsea Lately to discuss Captain America: The Winter Soldier! In case you missed it you can watch the video below, and check out high quality captures in the gallery now! Big thank you to my good friend Pedro of ChrisEvansHQ.com for the video! 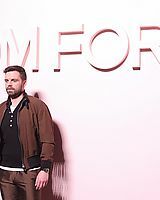 USAToday.com — It wasn’t long ago that most of the explosions in Sebastian Stan’s on-screen life were of the sort caused by catty teen girls on New York City’s Upper East Side. The stage-trained actor has left the TV soap-opera drama of Gossip Girl behind. Now, he’s armed with a cool costume, heavy weaponry, an abundance of psychological issues and, well, a metal arm as the complicated antagonist of Captain America: The Winter Soldier. 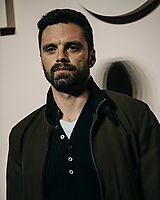 Drawing from a Marvel Comics story line, Stan’s Winter Soldier character is actually Bucky Barnes, the best friend and former partner of Captain America (Chris Evans) from World War II. Like Cap, Bucky was thought to be killed in the line of duty. But instead of being encased in ice for 70 years like his buddy, Bucky was brainwashed and turned into an assassin who now works for Hydra. His mission: Eliminate Cap, Nick Fury (Samuel L. Jackson) and pretty much anyone who gets in Hydra’s way. “Bucky had to essentially become like part machine,” says Stan, who reprises the role from 2011’s Captain America: The First Avenger. While the Winter Soldier is essentially a new character, the actor revisited some aspects of Bucky he established in the first movie for continuity’s sake — which are important when Cap and his new foe figure out their connection in the heat of battle. 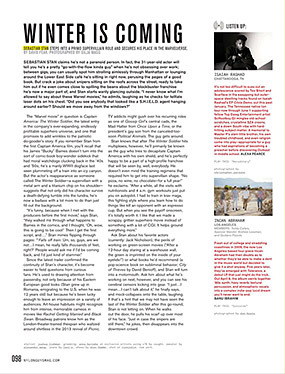 Sebastian Featured in Nylon Guys! 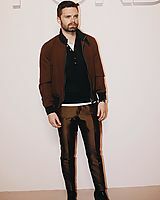 Sebastian is featured in the latest issue of Nylon Guys magazine for the month of May. You can view the scans in high quality over at the gallery now! More videos under the cut! Sebastian to Appear on Chelsea Lately! Set your DVR’s guys because Sebastian is gonna be on Chelsea Lately tonight! ClevelandMagazine.com — While actor Sebastian Stan completely changed his look for Captain America: The Winter Soldier, his character Bucky Barnes goes from being Captain America’s best friend to his arch-nemesis — the Winter Soldier. He opens up to us about the nuances of acting in a mask and the unprecedented access our city provided for the film. It’s exciting to see my character take this turn and show more sides of him. But, at the same time, it was challenging. I felt like I had a lot of homework to do. This character is so complex and tragic in a way and there are so many sides to him that hopefully we will see in the future. The Winter Soldier wears a mask for most of the film, which made it difficult for me to convey emotions. But it also kind of helped in a way. I felt when I was looking at myself in the mirror that I couldn’t recognize myself at all. I had to pay more attention to the way I behaved, the way I moved and the physicality of it all. A lot of the close combat was very difficult for us to shoot. It was hard because your heart is racing and you’re trying to get it right. But you’re also going over it in your mind, because you have rehearsed it so many times and you’re concerned with not hurting the other person. I did feel bad about shutting down the [West] Shoreway and the traffic problems that it caused, but I honestly never thought we would be granted that kind of access. Most times with these films you end up working with a green screen. I feel like you can really tell the difference with this one, because we didn’t. As an actor, it helps so much to be able to turn up on set and see an actual highway be shut down and explosions everywhere. You get goosebumps. His interest in acting began when his family moved to the US when he was a child. He had a meaty role in teen horror movie The Covenant (2006) but his showbiz career took off only after appearing as a recurring guest star in hit TV series Gossip Girl in 2007. Being a part of the huge Captain America franchise means no more bit parts for Stan. The 30-year-old is reportedly contracted to Marvel for nine pictures. Stan told comic-book news website Newsarama.com that the Marvel contract is “great job security”. Winter Soldier gets into a lot of hand-to-hand combat. Stan said he hoped to honour the legacy of great cinematic villains, particularly the late Heath Ledger’s performance as the Joker in The Dark Knight (2008). Stan may play a baddie but lead actor Chris Evans said Stan is “no way like his reel character”.